Juliet and Christina spent two days out at the Derwent Entertainment Centre along with a host of other businesses promoting Sustainable Building and Lifestyles. Congratulations to organiser James for a warm and informative event. FIMBY made loads of contacts and we're steadily working through the list of names of people who are keen to work with us to get their own gardens going. It was great to meet so many enthusiastic people. As a result of the expo, we've had some lovely offers from people to donate horse poo, stakes, worms etc. We've also given away lots of chillies, pumpkins and some aloe vera plants. 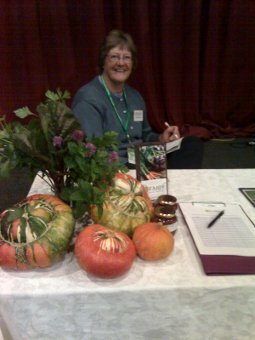 Check out the gallery pages for a photo of Suzi Hussey's beautiful flower arrangments which feature FIMBY pumpkins and chillies! The other big news arising from the expo is that we (Juliet and Christina) each bought a SCOOTER! woo hooo! Now we'll be able to visit clients in a less energy intensive way! Photos to come soon, once we've got our motorbike licences!